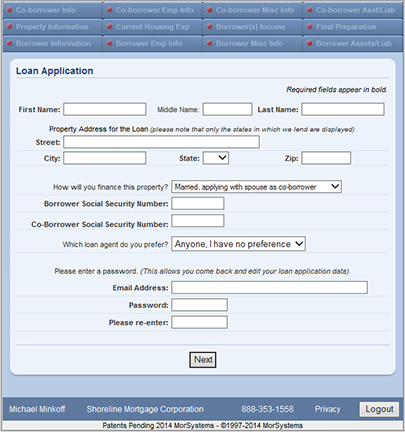 Our Online application is the easiest and most intuitive loan application on the internet. The application is setup into logical folders for ease of use. Each folder has either a red, yellow or green light: red for no data yet entered, yellow for partial data entries and green for completed sections. You will also find useful “tool tips” for each question. These tips contain answers for each field — it’s so easy to get it done!! Learn more about our online process below. If you have any questions, feel free to call one of our licensed loan advisors at 888-353-1558. Your first step would be to request application for loan approval. Simply click on the “Get Started” button below” and fill out our “secured online loan application”. The application will ask you questions about the home and your finances and takes less than 15 minutes to complete. Once we receive your on-line application our team will move into action. No later than the end of the next business day of completing your online application, a Licensed loan Advisor will contact you to introduce themselves and to answer any questions you may have. Your Loan Advisor is a mortgage expert and will provide help and guidance along the way. Depending on the strength of your application, we may even secure your approval that same day!! A complete set of application forms will be prepared inserting your personal information and transaction numbers. To expedite things as quickly as possible the application forms will be sent to you via email. The email will contain papers for you to sign and a list of items we’ll need to verify the information you provided about your finances during the on-line application. Typically this includes documents relating to your income and asset accounts like last years W-2 form, recent paycheck stub, and bank statement. If you prefer regular mail over email we can use a one day delivery service to get your application forms to you. We’ll even include a priority mail envelope to make it as easy as possible for you to return the papers. There is no loan application fee but you will be paying for your property appraisal using a credit card or even a bank debit card. We accept Visa, Mastercard, Discover or American Express. We’ll order the appraisal from a licensed appraiser who is familiar with home values in your area. Depending on your finances and the loan amount requested, different types of appraisals are used. Sometimes the appraiser will need to view the home, sometimes they are able to do their evaluation from the street. Title insurance will be necessary, if you are purchasing a home we’ll work with the Real Estate Broker or seller to insure the title work is ordered as soon as possible. If you are refinancing we’ll take care of ordering the title work for you. We’ll use the title insurance policy to confirm the legal status of your property and to prepare the closing documents. Your assigned Loan Advisor will keep you informed every step of the way via telephone or e-mail. After we receive your application kit, the appraisal, and the title work, we’ll contact you to schedule your loan closing. The closing will take place at the office of a title company or attorney in your area who will act as our agent. A few days before closing your Loan Advisor will contact you to walk through the final information so that there won’t be any surprises at closing.